How Will We Feed 9 Billion? National Geographic’s special feature on Feeding 9 Billion is a good resource, especially for their graphics illustrating key aspects of the challenge. Of the agricultural inputs it is water, land use and energy that get most of my attention. Land and energy collide when you consider how you will substitute low-carbon energy sources for electricity, fertilizers, machinery for 9 billion. 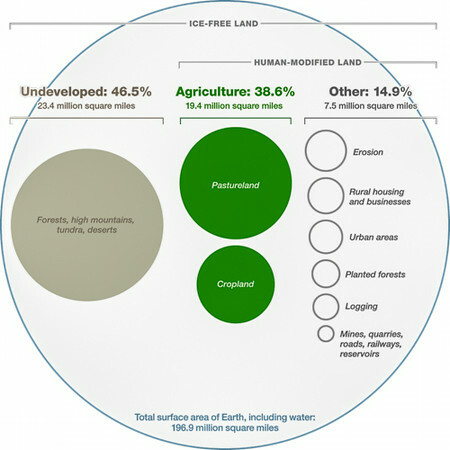 Study this graphic of Ice-Free Land, then ask yourself how you would solve these challenges? If you are wondering if there will be any farmland left after fossil fuels are replaced with renewables, a good place to begin is by studying energy expert Vaclav Smil’s Power Density Primer, and Energy Transitions. Lastly more Vaclav Smil, investigating the materials resources: Will nine billion people exhaust our materials resources? This entry was posted in Agriculture, Development, Energy Policy by Steve Darden. Bookmark the permalink. Thanks for the post and link to the National Geographic article. I just skimmed through it but didn’t see anything mentioned about how GMO could add to it. I simply cannot imagine we will be able to meet the demand without something groundbreaking. Pretty much like nuclear energy for power generation. I am cautiously optimistic that agricultural innovation can keep up – IF it not shackled by Greenpeace et al. There are multiple challenges that could reinforce is bad ways, e.g., water scarcity * expensive energy * bad growing weather. Failure will mean people suffer and die. So prohibiting modern technology (GMO, nuclear) seems completely stupid to me.